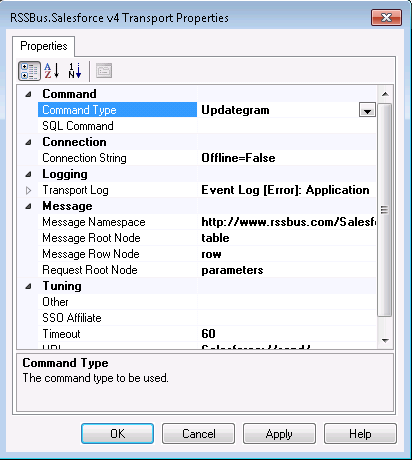 This section provides step-by-step instructions for creating, configuring, and testing a static solicit-response send port using the CData BizTalk Adapter. This article uses the adapter for Salesforce, but you can follow the same procedure for any CData adapter. You can use a static solicit-response send port to execute commands and access the results in BizTalk. You can use send ports to execute updategram commands, SQL commands, and stored procedure operations. Create a static solicit-response send port and configure it to use the adapter as its transport type. If you have not already done so, open your BizTalk application in the BizTalk Administration Console. In the node for your BizTalk application, right-click Send Ports and select New -> Static Solicit-Response Send Port. The Send Port Properties dialog is displayed. In the Send Port properties, enter a name for the receive port. In the Transport Type menu, select CData.Salesforce;. 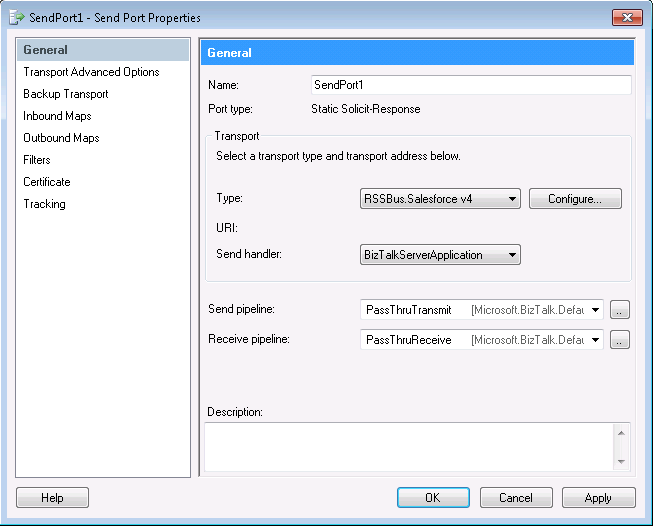 In the Send pipeline menu, select the default option, PassThruTransmit. In the Receive pipeline menu, select the default option, PassThruReceive. Define the command the adapter will execute in the Transport Properties dialog. In the send port properties, click the Configure button. The Adapter Transport Properties dialog is displayed. In the CommandType property, select the command type you want. If you want to execute an SQL command, enter the command in the SQL Command box. Refer to the "Adapter Configuration" chapter in the help documentation for a description of the various properties and their functions. Configure credentials and other properties required to connect to Salesforce in the Connection String Options dialog. In the send port properties, click Configure. The adapter properties dialog is displayed. Click the button in the Connection String property. The Connection String Options dialog is displayed. Enter the connection properties. Required connection properties are User, Password, and AccessToken. Click Test Connection to verify the values and test connectivity. Refer to the "Connection String Options" chapter in the help documentation for a description of the various properties and their functions. See the updategram tutorial for an example of a simple application that uses a solicit-response send port to execute an insert updategram to Salesforce.